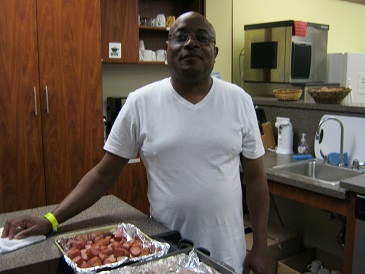 Guest Spotlight: "There is hope here"
Tony Gilmore loves to cook. While he and his mother, Doris, stayed at SECU Family House, you would find him in the community kitchen, preparing breakfast for other guests. Before he started chopping, stirring and cooking, this retired U.S. Army sergeant from Fayetteville, North Carolina, would first empty out all the dishwashers and make the first pots of coffee. As guests gradually entered the kitchen to begin their day before heading to UNC Hospitals, they were drawn to not only Tony’s kindness, but also to his infectious personality. Tony was his mother’s primary caretaker while she received treatment at UNC Hospitals for small cell lung cancer (SCLC). Doris is a retired school system custodian who was initially diagnosed at Cape Fear Valley Medical Center and referred to UNC Hospitals. Under the care of her oncologist, Dr. Carrie Lee and her radiation oncologist, Dr. Mahesh Varia, she underwent chemotherapy treatments for SCLC that had spread to her brain. During their stay, Tony got regular donations of food and gift cards from his hometown Food Lion for Family House. Tony happens to know this particular Food Lion well since they regularly donate to his church, too, where he is an ordained elder, is president of the kitchen committee, and - you guessed it – regularly prepares meals for the parishioners. His church, Cameron Temple Holy Bible Church, where Cheryl McClain is the pastor, and a local Kinlaws Supermarket also donated lunch items for Family House guests. Doris has the support of her three adult children, including Stevie, also a veteran from Fayetteville, plus the good dose of Tony’s cooking to help her persevere. Tony feels that he’s been blessed with a ministry to help others, and we know he has given spiritual and natural food to Family House guests. So glad places like this exist for people like my cousins Doris and Tony. It's heartwarming yo know that SECU provided such a nurturing and warm haven during a very stressful period. But I am not at all surprised that Tony went to work preparing meals for yhe redid ends. That is who he is. It's in his genes. He comes from a long line of caregivers...and cooks and people of faith.